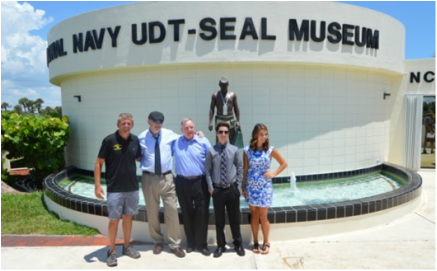 In the spring of 2015 this scholarship program in cooperation with the Navy Seal Museum Foundation and the Unit Scholarship Fund was created to honor my parents: CWO4 Ernest L. Hale (30 years USAF) and Gisela Hale (PhD in German Studies). To date over $305,000. in scholarships have been awarded. Why the the children of Special Operations members? In today's increasingly unstable world, their parents are typically the first responders to dangerous international situations. The sacrifices these individuals and their families are required to make deserve recognition and justify additional support from those they are helping to protect. For a Special Operations family, "having your kids end up OK" is much more challenging when one or more parents are deployed, preparing for deployment or even upon returning from deployment. The Marlee Foundation has committed to funding a minimum of $60,000.00 per year in EGHS awards through the year 2020. We welcome new corporate or individual sponsors to contribute. Every nickel will go to a Special Operations child's tuition, they will know who made the contribution, you will be recognized on this website and all contributions are 100% tax deductible. Please join us in expanding this much needed program. The (34) 2018 applications were extensive and included (4) Essay Questions. After reading just a few of these 136 essays it remains crystal clear that this program is very much needed and that these children are especially deserving of our support. 1. "The kindest person I have ever met. Please explain your choice"
2. " In your opinion, what percentage of media coverage should be factual v. op-ed and why?" 4. "Describe two things that you feel could improve our country's military readiness." The Marlee Foundation accept checks only. 100% of All Scholarship Donations go to the Children. Please direct all questions concerning the program to info@MarleeFoundation.com. We are very happy to discuss this effort in detail with any and all potential donors.